We a lot for granted when everything is just a click away. Information, pictures, video and audio clips can be sent by anyone, instantaneously, to anywhere in the world. However, until July 1898, wireless transmission didn’t exist. Everything changed after a Nobel Prize winning Italian inventor called Guglielmo Marconi sent the results of the Kingstown regatta from a steam tug called The Flying Huntress beyond Dún Laoghaire harbour to his assistant and shore receiver in the Harbourmaster’s house, which currently houses the Design Gallery between the Lexicon library and the Pavilion complex. The results were telephoned to newspaper offices and circulated all over the world. This was the very first time wireless technology was used in journalism. Look at where we are 119 years later. 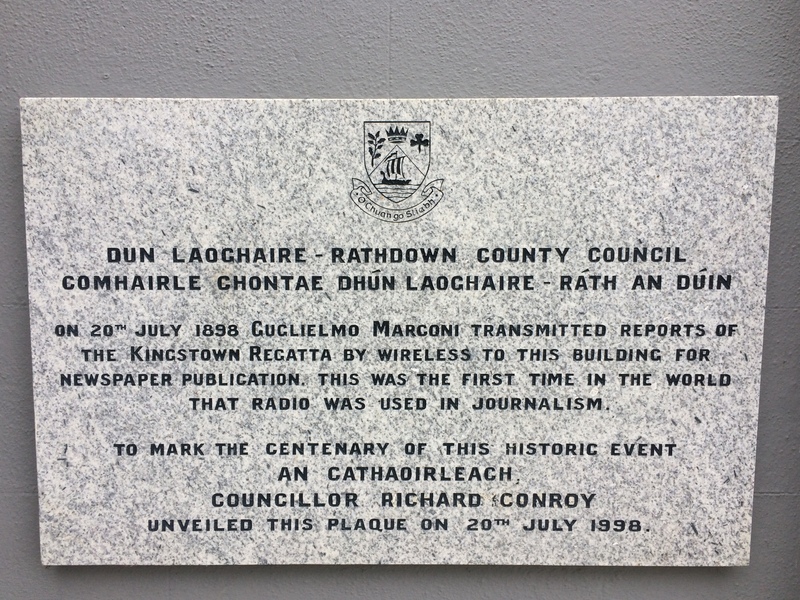 The plaque pictured above on the side of the Design Gallery directly opposite the basement entrance to the Lexicon library was erected in 1998 to commemorate the century of Marconi’s pioneering broadcast. Other events to mark that landmark anniversary included a re-enactment of the Kingstown regatta by the Royal St. George Yacht Club, plus special radio broadcasts from Moran House, the Maritime Museum and the Royal St. George Yacht Club. The radio pioneer’s descendent, Princess Elettra Marconi, was also in attendance. The Marconis have strong Irish connections, as Guglielmo’s mother Annie Jameson was the daughter of the Jameson and Sons whiskey founder, John Jameson. The use of wireless telegraphy spread like wildfire in sailing and sport. Here is a headline from The Buffalo Evening News from 17 August, 1899, excitedly announcing that it would be used in that year’s America’s Cup. In addition to the Design Gallery plaque, there is a prominent display in the Martime Museum of Ireland commemorating Marconi and his historic achievements in Dún Laoghaire. However, most of us walk by the spot where he changed history without realising that his wireless radio revolution started in Dún Laoghaire. Newstalk, 98 FM, Today FM and Spin 1038 all broadcast from Marconi House on Digge’s Lane, Dublin 2. That’s a fine article – as usual. I saw the plaque on the side of the Design Centre a while ago and I was thinking of finding out more about Marconi and you’ve done it for me – thanks. And speaking of Marconi, a friend of mine used to rent Teach Maconi in Rosslare (just down the road from Kelly’s Hotel). Apparently the great man owned the place which is now rented out to summer visitors – it was fairly ropey inside so I don’t expect it to be a big hit with the Airbnb crowd!